Durable construction,flexible, waterproof and easy cleaning. Warms root area 5-11°C / 10-20°F over ambient temperature. Can be placed in many different sizes of seedling bowl. Comes with a 1.9m / 6ft power cord. Big Size: 10" x 20" heat mat size with a 1.5m / 4.9ft power cord,it can be placed in many different sizes of seedling bowl. 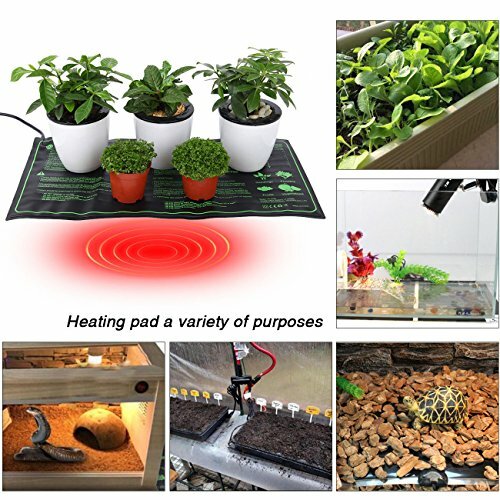 Improved Designed: The seedling heating mat is made from heavy duty PVC material with stronger heating wire.It is waterproof and easy cleaning. Tempreture: The heat mat warms root area 10 to 20°F above room temperature to improve root growth and increase germination rate. Advanced Heating Mat: Improves germination process and increases the success of seedlings and cuttings by a remarkable measure. Perfect for All Plant Types: Applied bottom heat is a real boon to virtually any planting in home garden.Espcially for growing veggies, herbs, or flowers.